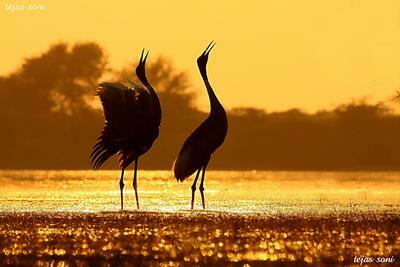 A beautiful silhouette of these two Sarus Cranes taken at Thol Lake, Mehsana, Gujarat. I have been trying to capture these Cranes for a long time in this warm lighting. I have been trying for around two months and this was my lucky day. I guess I am lucky to live near such a wonderful place and be able to capture it on my camera.